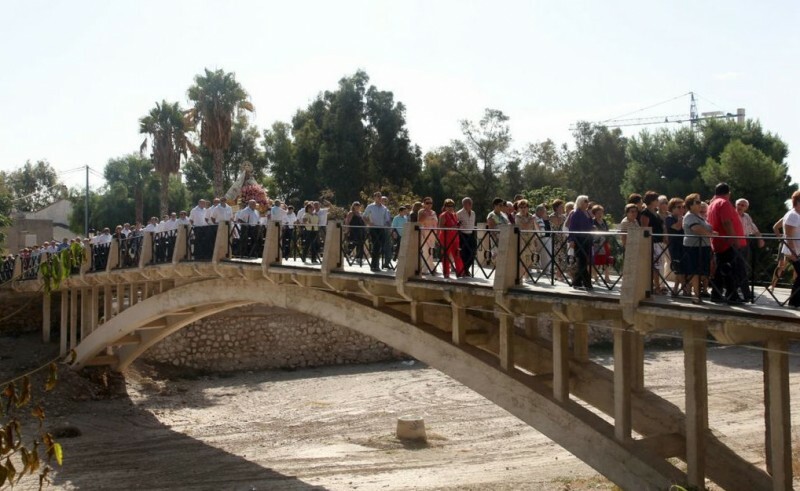 The Puente de la Torta is a footbridge in Lorca which crosses the Rambla de la Tiata in the eastern outskirts of the city, linking the leafy Alamedas with the Santa Quiteria trade fair and events venue and the district in which the convent and church of the Virgen de las Huertas are located. The bridge was designed by engineer Francisco Manrique de Lara and José Eugenio Ribera in 1910, and was something of a pioneer in Spain due to its use of reinforced concrete so that it could withstand flash flooding, an objective which has been achieved on numerous occasions since, the most recent being on 26th September 2012. A more recent threat to the survival of the bridge has been the plans for a new ring road to ease traffic congestion in the centre of Lorca, but it has been confirmed that no modification of the structure is permitted due to it having been declared a protected monument by the Town Hall: it therefore cannot be demolished or dismantled for re-assembly in another location, and the new ring road will eventually run underneath it. The central arch of the bridge has a span of 45 metres, and the whole structure is as elegant and slender as if it were built of iron rather than concrete. The 4-metre-wide surface was originally used by carriages, but is now reserved only for pedestrians and cyclists: however, in May and September it is also often included on the route followed by figure of the the Virgen de las Huertas as she is carried into the city for the Rosario de la Aurora and for the annual fiestas. Next to the bridge is the Partidor de los Tres Puentes, where water is directed into two channels which then serve the traditional irrigation system of ditches or “acequias” in the surrounding countryside. One of these channels leads to La Hoya and Tercia while the other supplies Rambla, Cazalla, Tamarchete and Marchena. Renovations and reinforcements have been necessary at the Puente de la Tortea on more than one occasion, the most recent being after the earthquake damage sustained on 11th May 2011.